Home › Uncategorized › Rah, rah, rah-rah-rah, gooooooooo Cougars!! Rah, rah, rah-rah-rah, gooooooooo Cougars!! 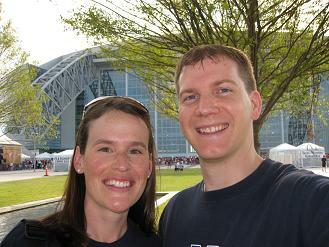 Kim and I went to the BYU/Oklahoma game on Saturday, and boy what a game it was! I have to admit, I didn’t give BYU much of a chance to win the game, but they proved me wrong. One of the greatest wins in BYU history, and we were there — pretty cool! 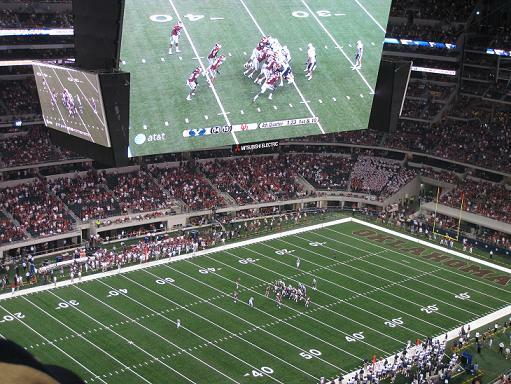 A brief word about the stadium… it is huge!! When we parked, we thought we had found a nice spot pretty close to the stadium. We started walking towards it, and after what felt like 2 miles we were still only halfway there. The place is so big that we thought we had parked a lot closer than we did. 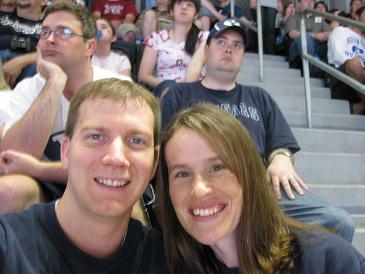 Once we got there, we made the long hike to our seats in the upper bowl. Did I mention that the place is huge? Here is a picture of us clear up in the top of the stands. Behind us you can see the nerdy guys that sounded like they had had a cram session on ESPN before the game so they could talk intelligently about football. I cringed every time they started talking. There was some pretty sloppy play on both sides, but it was exciting the whole way through. In the end, everything worked out the way it should, and this shot of the scoreboard says it all. I’m an OU fan but you are right…it was a good game! You are so dang lucky. What an amazing game! I love the smarty pants nerds that keep a running commentary that doesn’t really mean anything. It’s part of the live game experience, I guess. Nice pictures.